The Tectonics Festival takes place over the weekend of 4th–5th May in Glasgow. On the first day harpsichordist Mahan Esfahani will perform recent works by Anahita Abbasi, Miroslav Srnka, George Lewis as well as by one of the great pioneers of electronic music, Luc Ferrari. There are world premieres from the BBC SSO of works from Martin Arnold and Sarah Davachi; two BBC commissions from Christian Wolff and Juliana Hodkinson; a co-commission with WDR Cologne and the BBC from Mauro Lanza; and the UK Premieres of Jennifer Walshe’s The Site Of An Investigation and Andrew Hamilton’s c. Lucie Vítková is also in residence for the weekend with her installation Makeup Scores: Environmental Music. The work features scores drawn with old or expired make-up performed by Vítková with Maya Verlaak, Suze Whites and Jorge Boehringer. The Norfolk and Norwich Festival (10th–26th) offers a whole host of cultural events, including theatre, cabaret, circus, dance, literature and visual arts. Its list of contemporary music may be a little on the light side for some, but are interesting nevertheless: an ambitious new project Celebration combining music, poetry and dance on 11th; chamber music, including new compositions from June Talbot (voice), Iain Bellamy (saxophones) and Huw Warren (piano) on 13th; new works by Venezuelan singer Nella Rojas on 15th; pianist/composer Tord Gustavsen on 16th; and composer/organist Kit Downes on 22nd (see video, bottom, for a flavour of his work). Founded by John Metcalf in 1969, the Vale of Glamorgan Festival (18th–24th) is celebrating its 50th anniversary. It remains, as ever, focused on the music of today and particularly on music by Welsh or Welsh-based composers. World premieres this year include works by Charlie Barber, Mark David Boden, Graham Fitkin, Gareth Glyn, Lynne Plowman, Steph Power, Guto Pryderi Puw, Claire Victoria Roberts, David Roche, Ben Wallace and Robert Fokkens. The Prague Spring Festival goes on for the best part of a month (12th–4th June) and features around fifty concerts. Amongst these is the chance to hear Harfenianna, a new Concertino for Harp and Strings by Ondřej Kukal on 20th; Jakub Rataj’s æther for theremin, oboe & piano quintet on 24th; Jana Vöröšová’s Cloud Atlas for saxophone quartet on 26th; and the European premiere of Miroslav Srnka’s Overheating on 27th. Of the many other premieres one can hear this month (see my picks below), I make special mention of Roberto David Rusconi’s new work Variazioni Tiepolo at the Southbank Centre’s Purcell Room on 17th. Rusconi is a fascinating figure whose work is informed by shamanism, ritual, music embodiment and 3D sound projection. We will talk with him here on C:T next week. 1st Lighthouse, Poole. Leshnoff, Suite for Cello, Strings and Timpani. 2nd Queen's Hall, Edinburgh, Edinburgh. Dove, Accordion Concerto. Scottish Chamber Orchestra. 7th Royal Festival Hall, London. McDowall, Da Vinci Requiem. Philharmonia Orchestra, Wimbledon Choral Society. 9th Invisible Wind Factory, Liverpool. Goves, Parker, Zaba premieres. Solem String Quartet. 17th Purcell Room, London. Rusconi, Variazioni Tiepolo. Minguet Quartet. 18th BBC Hoddinott Hall, Cardiff. Bowden, Descent. BBC National Orchestra of Wales. 4th Liszt Academy: Grand Hall, Budapest. Elia, Implicate Inklings. Concerto Budapest. 8th Victoria Hall, Geneva. Montalbetti, Flute Concerto, “Memento vivere” Orchestre de la Suisse Romande. 17th Concertgebouw: Recital Hall, Amsterdam. Davies, New work. Asko/Schönberg. 18th Concertgebouw: Main Hall, Amsterdam. de Raaff, Violin Concerto no. 2 "North Atlantic Light”. Netherlands Philharmonic Orchestra. 22d Grieg Hall (Grieghallen), Bergen. Knausgård, New Work. 25th Universitetsaulaen, Universitet i Bergen, Bergen. Hvoslef, String Quartet no. 4. 25th Philharmonie 1: Grande salle Pierre Boulez, Paris. Jarrell, Piano Concerto. Orchestre Philharmonique de Radio France. 30th Concertgebouw Brugge: Chamber Music Hall, Bruges. Lang, Bernhard, HERMETIKA IX ‘vox angeli II.’ Nadar Ensemble. 2nd Walt Disney Concert Hall, Los Angeles. Andriessen, The only one. Los Angeles Philharmonic Orchestra. 10th Walt Disney Concert Hall, Los Angeles. Adès, New Ballet Work for Orchestra. Los Angeles Philharmonic Orchestra. 14th Saint-Sixte Church, Saint-Laurent, Montreal. Brown, Trumpet Concerto. Orchestre Métropolitain de Montréal. 19th University of Utah: Libby Gardner Concert Hall, Salt Lake City. Thomas, Folding. Thierry Fischer, Conductor; Madeleine Adkins, Violin; Davidson, Mark, Trombone; Hardink, Jason, Piano; Johnson, Matt, Cello; Smith, Mercedes, Flute. 24th Roy Thomson Hall, Toronto. Pal, New Work. Toronto Symphony Orchestra. It seems that the majestic Cavaille-Coll organ at Notre Dame has emerged from the dreadful conflagration relatively unscathed. Vincent Dubois, the organist titulaire, said ‘It’s a miracle! The most recent news, a priori, [the organ] is saved.’ He also however, stuck a note of caution about the stability of the building, especially the vault, which was severely damaged in the fire. The priority, he said, was to remove the instrument whilst repairs are made. This came as the first pictures have emerged of the inside of the building, which shows its fabric in much better shaped than many feared. In particular, the three rose windows, with their precious 13th century glass, appear intact. Arts Council England has published findings from a consultation exercise that aims to help formulate a strategy for its next ten years. Taking place between October 2018 and January 2019, they listened to the views of a number of interested parties—museums, libraries, arts organisations, funders, policy makers, local authorities, education and young people. The report can be read here. Following a speech given by ACE’s deputy chief director Simon Mellor given at East London Dance’s 2019 Ideas Summit, The Stage reported that the new direction would mean that ‘Relevance not excellence will be new litmus test for funding.’ This was latter denied by the ACE CEO Darren Henley, who tweeted: ‘ We see no opposition between ‘relevance’ and ‘excellence’. They can and should complement each other. The headline in The Stage article doesn’t reflect what was actually said in the speech it reported.’ He also said that no decisions had been made about the strategy and that a new round of consultations would begin in June. At that point, interested parties, including readers here can get involved. Sibelius has just released version 2019.4, with new playback features and enhancements to Review mode. Their upgrade email also offers a 40% discount on the NotePerformer sound library. That’s $77.99 instead of $129. I’ve always wanted to install a different sound set for Sibelius, but have been put off by reports of how difficult it can be to get them to work. NotePerformer claims to make the process as easy as using the built-in set. It also offers a full range of orchestral and brass band sounds, intelligent musical phrasing, a wide variety of articulations and nice extras such as a variety of pipe organ stops, brass mutes and effects such as bowed percussion, harmonics and snapped pizzicato. The set is also fully compatible with Finale and Dorico. Interested in the offer, I downloaded the demo version of NotePerformer 3 last night. It was as easy to install as they claim—once you have done so you simply choose the sound set in the configuration dialogue that contains the Sibelius sounds sets and general MIDI, then everything works as before. One thing I did notice, however, was that on my five-year-old Mac (8GB of RAM running latest version of Sibelius) there was a certain amount of lag when switching sounds in the mixer panel. At first I thought this a deal-breaker, but it soon settled to an acceptable level. This probably speaks more of my need to upgrade. The sounds themselves and the playback were at times revelatory, even if not without disappointments. First of all, the balance is much more convincing, with brass especially being much further forward than in the Sibelius set. The quality of the sounds were, in most cases, also much better than those of Sibelius. Sometimes the difference was shocking, as when I tried out a piece I had written for bassoon quartet. Whilst nothing can beat real players, it was surprising to find something that felt so immediate and convincing. Other tests of woodwind, brass and string yielded similar results—if your main interest is orchestral instruments this is an obvious purchase. Two areas of disappointment were harder to ignore. There is just one piano sound, which sounds like a Wild West saloon piano recorded in a bathroom. For such an essential instrument this is unforgivable. Also disappointing were the vocal samples. Whilst they are not great in Sibelius either, they do have a focus that was not present here, which to my mind makes them easier to work with. Despite these two disappointments, NotePerformer remains a tempting prospect. Now I’ve experienced it I think it’s an option I’m always going to want to have available. To make up your own mind I’d suggest checking out one of many YouTube videos that compare the installed Sibelius Sounds with NotePerformer (one of which you can find below). Or you can head straight over to the NotePerformer website and try their 30-day free trial. Sorry, but you couldn‘t be more wrong. Finally people like me and fellow artists might get the fees/royalties we rightly deserve, instead of corporate Hgoogle & Amazon exploiting us! No thanks Boris. Creative people deserve to be paid for their content. Only a minuscule amount of creative people are “rich and powerful” Most are scraping by. Except, the Government supported the directive throughout, including Arts 11 and 13. Also given EU such an important market, firms will end up having to comply anyway because- astoundingly, the Internet doesn’t stop at Dover. If you are ever inclined to become a little more familiar with the details, my office will be happy to guide you. I have been a working creative 20+ years. My work has been copywriten for decades, I don't need or want the EU to control that. Changing this will mean that people can't post my work & every time they do my work becomes better known. The internet made me successful. Creative people aren’t suddenly going to receive lots of royalties because of this. It’s going to damage the web as a whole, reduce interactions and transactions and hurt revenue as a whole. Like customs barriers on trading, it is harmful and typical of the EU. The Manchester-based ensemble Psappha has just launched ‘Composition Bank’, an initiative that allows music lovers to directly support the creation of new works. For the 2019–2020 season three composers have been selected as beneficiaries: Mark-Anthony Turnage, Alissa Firsova and George Stevenson. Donations start at £100 per score. Supported will get their names listed on the chosen score, invitations to workshops/rehearsals, the option to buy the score signed by the composer and an official certificate of support. The programme officially opens tomorrow (28th March), but the donations pages already appear to be live. NMC Recordings, a label whose mission is to bring music by British composers to the widest possible audience, will this month celebrate its 30th birthday. 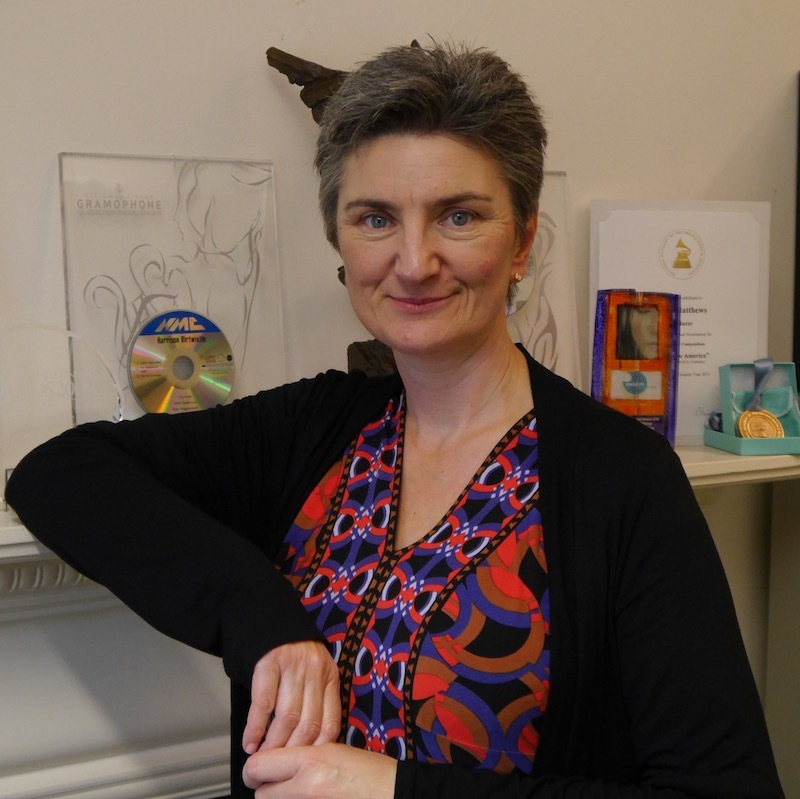 To mark the occasion, we talk with its Executive Director, Anne Rushton, about the label's past present and future. How did NMC Recordings come to be formed? Imogen Holst and Colin Matthews (composer, founder and Executive Producer of NMC) set up the Holst Foundation, shortly before Imogen's death in 1984. Imogen had made it clear that the future role should not be to subsidise her father's music in the way that most other composer trusts function. Instead she hoped that it would be able to support the work of living composers and the idea that this might be done via recordings, enabling new work to reach wider audiences, had been mooted. Roll on a few years when The Holst Foundation supported a concert at the Aldeburgh Festival, featuring the Philharmonia conducted by Oliver Knussen. There was an audience of 800 but as the concert wasn't broadcast the Foundation realised that their, not inconsiderable, financial support wasn't having as much impact as it might - and the idea of recordings was revived. NMC's first release, under the auspices of the Society for the Promotion of New Music, of Jonathan Harvey's Bhakti, was in April 1989. Why was there such a pressing need for NMC? There's a perennial challenge for composers in having their work heard. This isn't just for promotional or financial reasons, not that there's anything wrong with those. For most it strikes to the very essence of why they compose; to communicate their creative ideas to those who will listen. And with the inherent limitations (financial and logistical) of putting on new music concerts, recording is the ideal way to ensure that work gets heard, and heard again. Back in the late 80's there were labels which featured occasional contemporary releases, but the representation of living British composers in the record catalogues was very poor: extraordinary to think that, back then, Harrison Birtwistle had only one major recording available (Secret Theatre, now reissued on NMC D148), while Jonathan Harvey had reached the age of 50 without a single significant disc until we released Bhakti. NMC's mission was to redress that underrepresentation and in the process we've become the dedicated home for the work of composers from the British Isles, across a range of styles, chosen and maintained in the catalogue in the face of commercial considerations. Les Bienveillantes is Hèctor Parra’s sixth major theatre work. It is based upon Jonathan Littell's 2006 novel The Kindly Ones (Les Bienveillantes), which explores a fictional protagonist who helped carry out the Holocaust and was present at key events during World War 2. Opera Ballet Vlaanderen give the premiere in Antwerp on 24th, with subsequent performances running into May. Tarik O’Regan’s new opera, The Phoenix, tells the life of Mozart’s librettist Lorenzo da Ponte. Starting life as a priest and poet, he was banished when it was discovered that had a secret family and was a frequenter of brothels. Despite flourishing as a librettist he eventually faced bankruptcy and fled to America, earning a living as a greengrocer before founding New York City’s first opera company. The work, to a libretto by John Caird, starts its run at Houston Grand Opera on 26th April. Oceane is Detlev Glanert’s second collaboration with librettist Hans-Ulrich Treichel. It is based upon a unfinished novella by Theodor Fontane that ‘attempts to encapsulate in the form of Melusine the sense of menace and fascination felt by a bourgeois, male-dominated society faced with femininity coupled with an archaic, erotically permissive artlessness.’ Deutsche Oper Berlin give the premiere on 28th, with performance continuing into May. Not a premiere but also worth consideration is Alexander Vustin’s opera Le Diable Amoureeux. Based upon Jacques Cazotte’s novel of the same name, it tells of a demon that falls in love with a young nobleman and, in the guise of a young woman, attempts to win his affections. Despite the work being finished in 1989 (after nearly fifteen years of composing) it did not receive its first performance until February of this year. The performances on 5th and 7th April at the Stanislavsky and Nemirovich-Danchenko Moscow Music Theatre could be your last chance to experience it. Joby Talbot’s new cantata, Sheen of Dew on Flowers, sets rare and sensual poetry across several millennia in a concert that celebrated the partnership of Queen Victoria and Prince Albert. It is performed by the Britten Sinfonia at the Barbican on 11th. A new work by Harrison Birtwistle is always an event, even when the work itself is small. Duet for 8 Strings for viola and cello will be performed by the Nash Ensemble at Wigmore Hall, London on 12th. There will be a section of other works by the composers, as well as Mosaic by Elliott Carter and, poignantly, a posthumous UK premiere for Oliver Knussen’s Study for 'Metamorphosis' for solo bassoon. Also enticing is a new work, KRONOS-KRYPTOS for percussion quintet, by George Crumb, to be performed by the Chamber Music Society of Lincoln Center, New York City on 14th. It forms part of an all-Crumb concert celebrating the composer’s 90th birthday year. There will, furthermore, be a chance to hear more works, including his awe-awe-importing Black Angels for Electric String Quartet, on 16th. 8th OSO Arts Centre, London. Luciano, Clarinet Sonata no. 8. 11th Barbican Hall, London. Talbot, A Sheen of Dew on Flowers. Britten Sinfonia. 12th Wigmore Hall, London. Birtwistle, Duet for 8 Strings for viola and cello. Nash Ensemble. 4th Sibelius Hall, Lahti. Aho, Symphony no. 17. Lahti Symphony Orchestra. 4th DR Koncerthuset: Concert Hall, Copenhagen. Ruders, Accordion concerto. Danish National Symphony Orchestra. 4th Maison de la radio:Auditorium, Paris. Robin, New work. Orchestre National de France. 5th, 7th Stanislavsky and Nemirovich-Danchenko Moscow Music Theatre: Main Stage, Moscow. Vustin, The Devil in Love. Stanislavsky Opera. 6th Concertgebouw: Main Hall, Amsterdam. Nas, Horseless Carriage. Mahler Chamber Orchestra. 7th Konserthuset Stockholm: Grünewaldsalen, Stockholm. Lindgren, Nonet. Ensemble Misto. 8th Pesti Vigadó (Vigadó Concert Hall), Budapest. Mizuki, New Work. Ruka Yokoyama, Piano. 13th (dates into May): GöteborgsOperan, Gothenburg. Martinů, Trois fragments de Juliette (World première staging). Göteborg Opera. 25th De Doelen: Grote Zaal, Rotterdam. Wagemans, Love, baby love. Nederlands Kamerkoor, Rotterdam Philharmonic Orchestra. 25th Conservatoire Darius Milhaud: Auditorium Campra, Aix-en-Provence. Attahir, Mélodies. Trio Zadig, String Trio. 30th Temple Church, London. Bruce, New Work for soprano and bass. 7th Collins Center for the Arts, Orono. Richman, New Work. Bangor Symphony Orchestra. 13th Hong Kong City Hall: Concert Hall, Hong Kong. Leung, Life Episode II. Hong Kong Sinfonietta. 14th Lincoln Center: Alice Tully Hall, New York City. Crumb, New Work for Percussion Quintet. 23rd Carnegie Hall: Weill, New York City. Chang, Cello Sonata. 26th Wortham Theater Center: Houston Grand Opera, Houston. O'Regan, The Phoenix. Houston Grand Opera.